Abstract: In order for bait matrices, treated wood and resistant wood species to be properly evaluated in the laboratory for termite resistance or palatability, reliable tests that can distinguish between food choices must be developed; otherwise, inferior products may enter the marketplace. In the current study, a bioassay method is proposed that allows the calculation of two new feeding indexes, a Wood Resistance Index (WRI) and a Termite Preference Index (TPI). These indexes incorporate the feeding behavior of termites in both choice and no-choice situations. In tests using Reticulitermes flavipes (Kollar), the WRI consistently provided statistically significant comparisons between three wood species: pine, water oak and red cedar. The TPI and WRI, though not without limitations, convey more information than other common measures of feeding. Termite feeding preference assays are commonly used in the evaluation of naturally resistant wood, pressure-treated wood, or termite bait matrices. Numerous studies have reported the relative preference of termites for different wood species (just a few of many examples: Wolcott 1957, Carter 1975, Carter and Dell 1976, Carter et al. 1976, Carter et al. 1981, Waller et al 1990, Arango et al. 2006). Some wood species are commonly classified as “termite resistant” while others are deemed “susceptible.” Various evaluation methods for feeding are reported in the literature, but most involve no-choice tests, choice tests, or both. In a no-choice situation, termites are introduced into an arena where only one choice of food is available, often a wood block, and the mass or percentage loss of the wood over a specified time is measured. In a choice situation, the termites are exposed to two or more options: treatments of interest and a reference (treated wood versus untreated wood, bait matrix with the active ingredient versus the bait matrix without the active ingredient, etc.). Feeding on each respective choice is evaluated. It is difficult to compare termite feeding between choice and no-choice tests because termites may consume a non-preferred food option in the absence of a more preferred option (Cruz-Rivera and Hay 2000). The terms “resistant” and “susceptible” are therefore relative, and may depend upon test conditions. In a choice test, for example, termites may avoid a certain wood when a more preferred wood is available, yet feed on the same wood in a no-choice situation out of necessity (a “conditionally consumed” choice, called “compensatory feeding” by Cruz-Rivera and Hay (2000)). “Unpalatable” foods are those that are not fed upon under any circumstances, while “preferred” foods are readily consumed regardless of other food choices. Choice tests are limited in their ability to distinguish between food sources that are conditionally consumed and those that are unpalatable and may overestimate resistance. No-choice tests, on the other hand, cannot distinguish between food sources that are readily consumed and conditionally consumed and may overestimate susceptibility. It would be helpful if an assay were developed to better quantify termite preference or wood resistance by using choice and no-choice tests in the laboratory. Such a method is proposed by the current study, with the introduction of two new indexes that make use of the choice and no-choice feeding behavior of termites. These indexes may prove useful as a laboratory tool to determine termite preference or wood resistance. Abbreviations used. Tn = mass (mg) wood consumed in the test wood of a no-choice test; Tc = mass (mg) wood consumed in the test wood of a choice test; Rn = mass (mg) wood consumed in the reference wood of a no-choice test; Rc = mass (mg) of wood consumed of the reference wood in a choice test; WRI = Wood Resistance Index; TPI = Termite Preference Index; CMI = Chesson-Manly Index; It = initial mass (mg) of the test wood in a choice test; Ft = final mass (mg) of the test wood in a choice test; Ir = initial mass (mg) of the reference wood in a choice test; Fr = final mass (mg) of the reference wood in a choice test; SEM = standard error of the mean; GLM = general linear model. Bioassays. Choice and no-choice assays were conducted with three wood species. Yellow pine (Pinus sp.) was used as the reference wood in all tests, and the test woods consisted of water oak (Quercus nigra,often considered susceptible to termites), and red cedar (Juniperus virginiana, often considered termite resistant). In order to evaluate our results when two food choices are equivalent, a fourth group of wood blocks was used, denoted pine', as a test group to compare to the pine reference blocks. Samples of each of the woods were cut into 1 by 1 by 1.5 cm blocks and oven-dried at 70 °C for 48 hours, and each species was cut from the same board. Upon removal from the oven, the blocks were immediately placed in a desiccator with Drierite to prevent absorption of atmospheric humidity. The initial mass of each wood block was determined by using a Mettler-Toledo AT400 analytical balance. Bioassays were conducted in 50 mm ID x 43 mm dishes that contained 30 ± 1 g sand and 4.5 ml water (15% moisture by weight). The test set up required three such dishes per treatment group: one no-choice dish of the test wood, one no-choice dish of the reference wood, and one choice dish containing one block of the test wood and one block of the reference wood (Figure 1). To save time and materials, one set of pine (reference wood) no-choice dishes was used per population and per trial for all wood types, rather than each wood type having its own set of pine no-choice dishes. In the pine-pine' choice dishes, the side (right or left) containing the pine' block was kept consistent. Figure 1. Three-dish bioassay method for calculation of TPI and WRI. A = no-choice dish with reference wood, B = no-choice dish with test wood, C = choice dish with both reference and test wood. The test was conducted three times. All termite populations were collected from naturally infested pine bolts and maintained in metal garbage cans in the laboratory at ambient conditions. The termites were not removed from the naturally infested bolts until the day of testing. In trial 1, conducted for 21 days in December 2004, two populations of Reticulitermes flavipes, one collected November 2003 and the second collected September 2003, both from Choctaw County, MS were used in the test, with five replications, and the tests on both populations were conducted concurrently. In trial 2, which was conducted for 28 days in December 2005, had ten replications and used one R. flavipes colony collected from Oktibbeha County, MS in October 2004. Trial 3 was conducted over 28 days in March and April 2006 with termites from the same population as used in trial 2. At the conclusion of the test, the wood blocks were rinsed with tap water to remove sand and feces, and then dried at the conditions described above and weighed. The mass of wood consumed was found by subtraction of the final mass from the initial mass. Indexes of Termite Preference and Resistance. 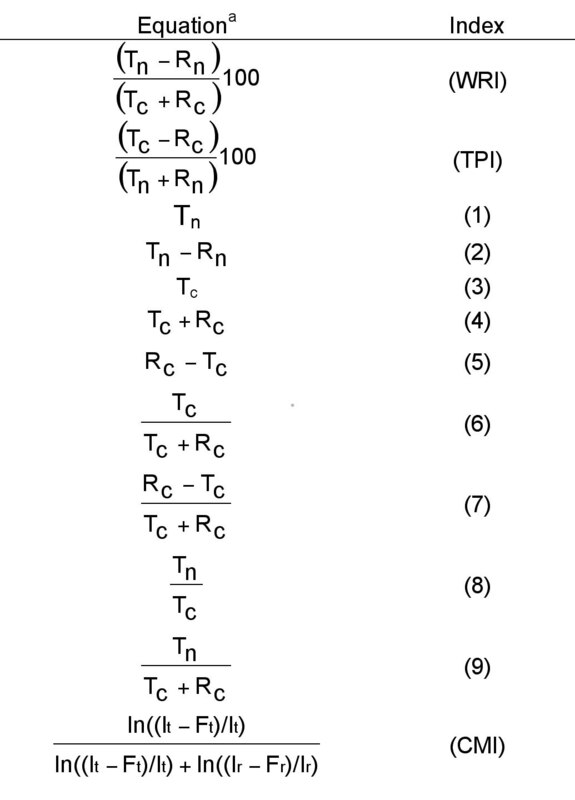 The Wood Resistance Index (WRI) and the Termite Preference Index (TPI) were calculated by using the equations in Table 1. Table 1. Indexes and formulae for feeding parameters calculated in this study. Traditional standard errors for the WRI and TPI could not be calculated because the same reference wood no-choice dishes were used for all test woods, and therefore the index value for each species was not truly independent from the other species. The 95% confidence intervals for the WRI and TPI were calculated by “bootstrapping” the collected data. In bootstrapping, a computer randomly samples, with replacement, the collected data and the index value is calculated many times (here 5000). The range of index values containing 95% of the new computed values is the 95% confidence interval. Other indexes calculated in this study are reported in Table 1. The Chesson-Manly Index (CMI) is based on Chesson’s modification (Chesson 1983) of Manly’s equations (Manly et al. 1972), and the confidence interval was calculated by bootstrapping. Significance due to wood species was calculated by the general linear model procedure on SAS (SAS Institute 2001). Table 2 reports values and 95% confidence intervals for the TPI and WRI. Table 2. Values (95% confidence interval) for the TPI and WRI. a Confidence interval could not be calculated due to high mortality. *Significance due to wood species was determined (a = 0.05). The WRI is a measure of a wood’s resistance to termite attack relative to a reference wood. It is based on the difference in the amount (mg) of test and reference wood eaten in two no-choice tests as a percentage of the total amount of wood eaten in a choice test. Negative values indicate test woods that are less consumed than the reference wood, and are therefore resistant, while positive values indicate woods that are consumed more readily than the reference wood, and are therefore preferred. The WRI, however, is unable to differentiate between woods that are equivalent and those that are conditionally consumed. In both cases, the WRI is near zero because the same amount of food is consumed in both no-choice tests regardless of whether they are preferred or conditionally consumed. Values of 100 are only possible when the reference wood is not consumed in the choice or the no-choice tests, an unlikely event. In Table 2, the WRI was near zero for pine' in all three trials. Significance due to wood species was seen in all three trials, and the observed WRI values were near what would be expected, assuming that pine is less resistant than water oak, which is less resistant than red cedar. In trial 3, the confidence interval for water oak overlaps that for pine' although overall significance due to wood species was determined. The confidence interval for red cedar in population 1 and for water oak and red cedar in population 2 could not be calculated due to high mortality in these dishes (especially the no-choice test wood dishes). The TPI is found by rearranging the same data collected for the WRI, and relates the difference in mass of food eaten between the two choices in the choice test as a percentage of the total mass of the same two choices consumed in no-choice situations (Table 1). The TPI is a measure of the termites’ preference for a test wood relative to a reference wood. Positive values of this index indicate test woods that are preferred to the reference wood, negative values indicate a non-preferred wood, and a value of zero indicates that the two choices are equivalent. Completely unpalatable woods have a value of -100 because the test wood is not consumed in either case. Conditionally consumed woods should have values no greater than zero and approach -100 as the wood decreases in palatability. For preferred woods, with values above zero, the index would rarely exceed 50 even for “strongly preferred” choices, because there are twice as many termites in the two no-choice dishes, consuming twice as much total wood as that consumed in the choice test. A value of 100 is only possible in the event that the reference wood is not consumed in either test (i.e. when the reference wood is unpalatable). 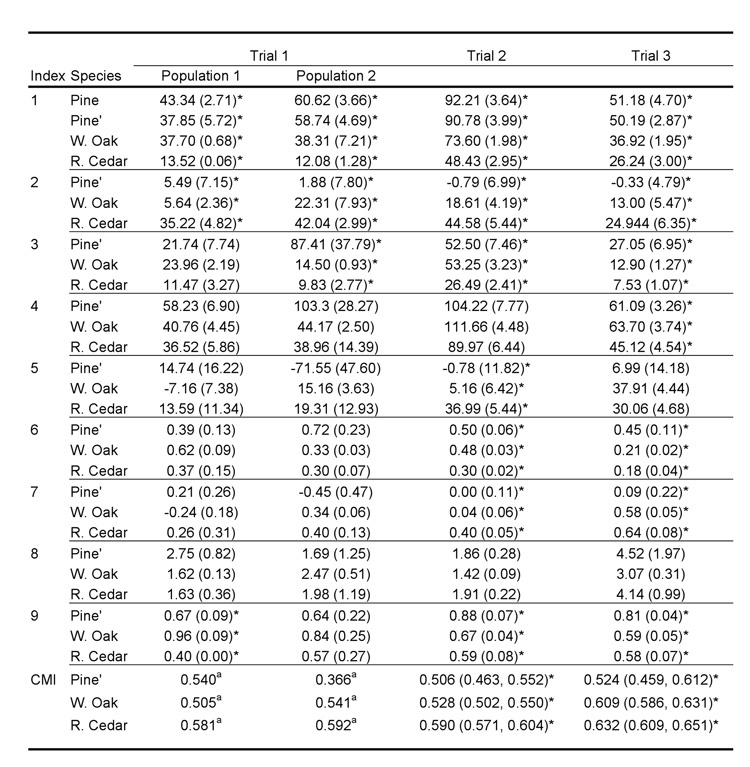 In trial 1 the TPI confidence interval could not be calculated for red cedar in population 1 or for water oak or red cedar in population 2 due to death of termites in several of the replications (Table 2). Significance due to wood species was seen for the two 10-replication trials, where it was not in the 5-replication trials. In trials 2 and 3, the TPI for pine' was near zero, as expected. Different decisions regarding relative preference were reached between trials 2 and 3, however. In trial 2, water oak has a TPI near that for pine', while in trial 3 the TPI for water oak is near that of red cedar. Comparisons of the WRI and TPI between different test woods are valid only when compared to the same reference wood. For example, TPI values obtained by comparing red cedar to pine are not equivalent to TPI values obtained by comparing red cedar to spruce. Similarly, values may not be directly compared between different termite species. The TPI and WRI may be calculated based on the percentage of wood eaten only if the initial mass of all the test blocks is approximately equal. Blocks that are larger will result in lower percentage consumed values even if the same amount of wood is consumed. Table 3. Values of other indexes calculated. Several other measures of wood palatability (shown in Table 1) were calculated from the data obtained (Table 3). Although some showed the expected significance in feeding due to wood species, few of them lead to unambiguous results. For example, indexes 3, 6 and 7 all showed significance due to wood species in trials 2 and 3, yet in trial 2 pine' was approximately equivalent to water oak while in trial 3 water oak was approximately equivalent to red cedar. Index 9 gave unambiguous results in trial 2, but in trial 3 water oak and red cedar had almost identical values. The two new indexes reported here, the WRI and the TPI, provide a method for incorporating the behavior of termites in both choice and no-choice situations, something not allowed by the other indexes. The WRI and TPI can be statistically analyzed in a way to detect differences in wood palatability. An improvement to the proposed method would be to conduct separate no-choice tests of the reference wood for each treatment, rather than a global no-choice test of the reference wood. This would allow the WRI and TPI values to be independent between test species, and would eliminate the need for bootstrap analysis to calculate confidence intervals. Another potential improvement is to record mortality, and calculate adjusted indexes to account for mortality. Although some of the other possible indexes (indexes 1 through 9 and the CMI) also showed statistically significant results, the WRI provided unambiguous results in all three trials. Based on what is expected, the WRI is a more sensitive measure than the TPI. Of course, we have assumed that there is a difference in termite feeding between the different wood species, when in fact there may not be (a type I error). Arango, R. A., F. Green, K. Hintz, P. K. Lebow and R. B. Miller. 2006. Natural durability of tropical and native woods against termite damage by Reticulitermes flavipes (Kollar). Int. Biodeter. Biodegrad. 57: 146-150. Carter, F. L. 1975. Responses of subterranean termites to wood extractives. Material und Organismen 3: 357-364. Carter, F .L. and T. R. Dell. 1981. Screening selected American hardwoods for natural resistance to a native subterranean termite, Reticulitermes flavipes (Kollar). USDA Forest Service Papers SO-176. New Orleans, LA. p. 1-10. Carter, F. L., T. L. Amburgey, and F. G. Manwiller. 1976. Resistance of 22 southern hardwoods to wood-decay fungi and subterranean termites. Wood Sci. 8: 223-226. Chesson, J. 1983. The estimation and analysis of preference and its relationship to foraging models. Ecology 64: 1297-1304. Cruz-Rivera, E. and M. E. Hay. 2000. Can quantity replace quality? Food choice, compensatory feeding, and fitness of marine mesograzers. Ecology 81: 201-219. Manly, B. F. J., Miller, P., and L. M. Cook. 1972. Analysis of a selective predation experiment. American Naturalist 106: 719-736. SAS Institute. 2001. Version 8.02. SAS Institute, Cary, NC. Waller, D. A., C. G. Jones, and J. P. La Fage. 1990. Measuring wood preference in termites. Entomol. Exp. Appl. 56: 117-123. Wolcott, G. N. 1957. Inherent natural resistance of woods to the attack of the West Indian dry-wood termite, Cryptotermes brevis Walker. J. Agric. Univ. Puerto Rico 41: 259-311.